Art performs many different functions within a society, but for those outside that society one of the key roles of art, and one not always well-understood, is to reveal how that society communicates in a visual sense, both internally and externally. This is especially pertinent to comprehending the complex cultural relations between the Islamic world and Europe, which often demonstrate far more permeable, open and elastic boundaries than political history might suggest even up to the present day. This is apart from those border regions such as southern Italy, Spain, and the Balkans where a widespread and intense intermingling and meeting of the spirit would most naturally occur. The exchange of artistic ideas between the Islamic world and the West was extensive and was never exclusively one-sided although there were certainly periods, places and even artistic movements that had a clear West-East or East-West trajectory. Certainly, too, there was admiration on both sides, but in Europe especially, Islamic art, which lacked a clearly religious figural iconography that might have offended western Christians, seems to have received a warm reception. It was admired for the rarity of the materials from which it was made and the skill and finesse with which it was created; this appreciation clearly transcended any cultural or religious boundaries as examples of Islamic art—silk textiles, rock crystal containers, enameled glass vessels (fig. 1), gold and silver inlaid brass basins, became treasured items associated with Christian relics and rituals (Ettinghausen, 1974). Even writing in Arabic was not excluded but was rather copied and imitated in the later Middle ages and early Renaissance in the inscribed halo or in the garments in paintings of the Holy Family and saints, as in the central panel of the famed San Governable triptych by Masaccio dated 1422 (fig. 2); here the Virgin Mary’s golden halo is inscribed with a pseudo-Arabic text, which imitates the curved letter shapes to simulate Arabic writing but without any meaning. (Mack, 2002; and see below). This introductory section first of all will define the term “Islamic art,” including its geographical and temporal parameters, and the different media, designs, and iconographies involved. “Islamic art” not only describes the art created specifically in the service of Islam, but it also characterizes secular art produced in lands under Islamic rule or influence, whatever the artist’s or the patron’s religious affiliation. Islamic art is often marked by strong regional characteristics as well as by significant influences from other cultures, yet it retains an overall coherence that is remarkable given its vast geographical and chronological boundaries—from southern Spain to northern India and from the seventh century onward. There are certain common features that distinguish the arts of all Islamic lands. Calligraphy, which is regarded as the noblest of art forms, is the principal and most pervasive element on account of its association with the Qur’an (fig. 3). Another characteristic trait is a preference for covering surfaces with patterns composed of geometric or vegetal motifs such as the arabesque. Essentially a denaturalized vegetal- based design capable of infinite repetition, the arabesque is a decorative element particularly well-suited to framing, connecting, and filling (fig. 4). However, the term arabesque is of western origin and was in use by the seventeenth century to describe a generic type of Islamic ornament also emulated in European art. Contrary to popular belief, figural imagery is also a significant aspect of Islamic art although it is excluded from the decoration of religious monuments and their furnishings and is therefore found primarily in a private context, as in an illustrated manuscript (fig. 5). Figural representation is not forbidden in the Qur’an; rather it is the making of idols that is prohibited. Another type of literature known as hadith and second in importance to the Qur’an, does express by the example of the Prophet Muhammad a clear reluctance toward images (Grabar, 1987). In the Islamic world, the primary means of artistic expression is in the so-called decorative arts, along with architecture and its decoration. Illuminated manuscripts, inlaid metalwork, blown glass, glazed ceramics, carved ivory, wood, stone, and woven textiles and carpets all absorbed the creative energies of artists, becoming highly developed art forms. These works include small-scale objects, such as delicate glass or rock crystal vessels, as well as more monumental architectural decoration, for example, glazed tile panels from building façades. Such objects were meticulously fabricated and carefully embellished suggesting that the people for whom they were made sought to surround themselves with beauty. Most of these objects were portable, so portable that the vast majority have long since been removed from their original context. Many were in fact intended to travel as gifts or as items of trade. 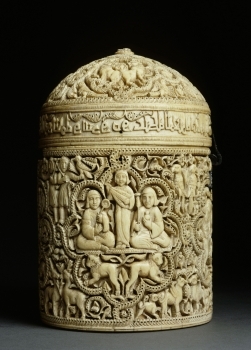 The extreme portability of this art helped in the dissemination of artistic ideas and techniques within and beyond the Islamic world, including Europe. Royal patronage played an important role in the making of Islamic art, just as it has in the arts of other cultures. The construction of mosques and other religious buildings, including their decoration and furnishings, was the responsibility of the ruler and the prerogative of high court officials and members of the ruling elite. Royal patronage of secular art was also a standard feature of Islamic sovereignty, which enabled the ruler to demonstrate the magnificence of his court and, by extension, the superiority of his state. 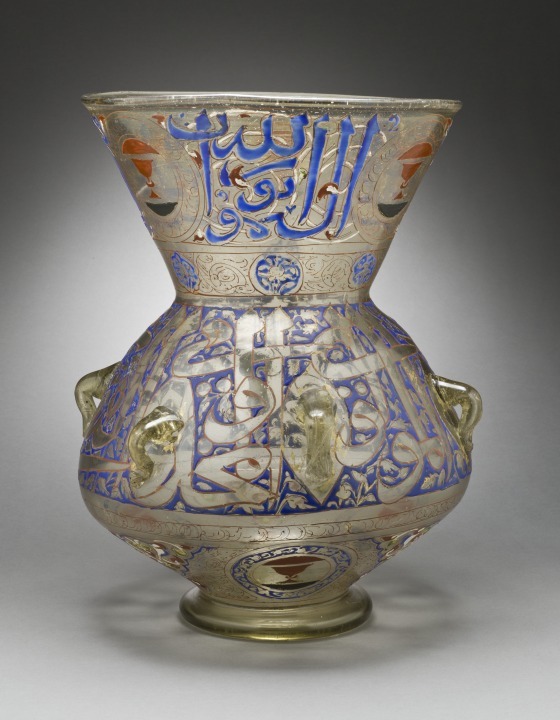 Not all works of Islamic art were sponsored by the court; indeed, many of the objects and manuscripts preserved in museum collections originated elsewhere. While these are often made from less rare and costly materials they nonetheless reflect the same styles and make use of the same forms and techniques employed in court arts. Islamic art is generally the work of anonymous artists. Some names are preserved through the artists’ signatures as found on metalwork, pottery, carved wood and stone and textiles and carpets; however, it is not always readily apparent whether the signee physically made the object or was rather responsible for creating the designs with which it was decorated. 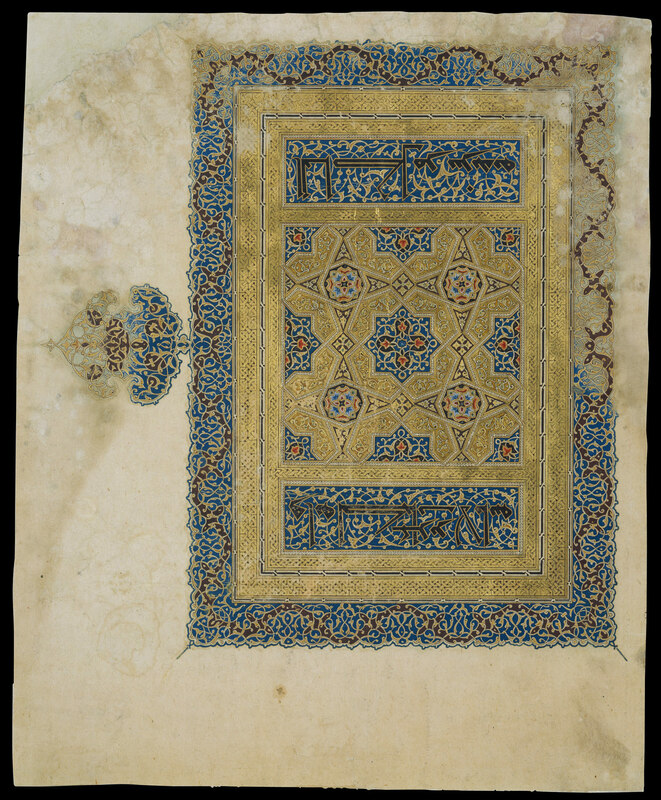 One area of Islamic art for which there are more signatures and often with greater specificity is in the arts of the book. The names of certain calligraphers are well known—not surprising given the importance of the written word in Islam (Blair, 2006), as are those of many painters, most of whom were attached to a particular court. The discussion that follows will be constructed in chronological fashion, dividing the material into five broad periods: 1) Late Antique/Early Islamic, seventh – tenth century; 2) Early Medieval, eleventh – mid-thirteenth century; 3) Late Medieval, mid- thirteenth – fifteenth century; 4) Late Islamic, sixteenth – nineteenth century; and 5) as an epilogue, Modern-Contemporary, nineteenth century – present. It is to this period that the origins of Islamic art date—it was a time of experimentation and openness to absorbing, reiterating and reinterpreting other artistic traditions. The assimilation and imaginative reinvention of pre-Islamic decorative themes and motifs—as well as techniques, styles, and forms—characterize much of the art of early Islamic times. Among those artistic traditions that played the greatest role in the formulation of a new style of Islamic art is that of the Late Antique period, primarily the art of the Greco-Roman tradition in eastern Mediterranean lands. For example, the plant- based decorative vocabulary of the Late Antique played was vital to the development of the characteristic Islamic design known as the arabesque. Other less long-lived floral based designs that developed in this period are likewise derived from the lexicon of late classical art. For example, (fig. 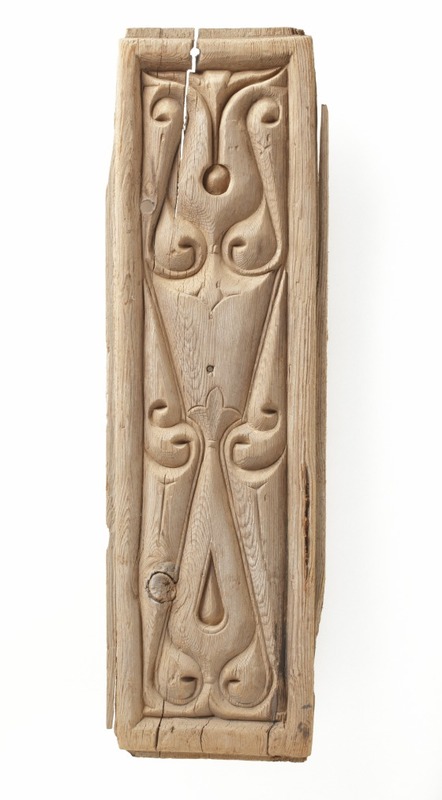 6) in a ninth-century wood panel from Egypt the carved design is comprised of highly stylized leaves that have been transformed into something still more abstract—a dense pattern in which it is impossible to distinguish foreground from background or primary design from secondary one. Early Islamic glass demonstrates the use of late Roman techniques and forms adapted and transformed to suit a new taste or to meet new needs. The classic basket-like perfume container known as a balsamarium is transformed by the early Islamic artist into a related type of vessel but one supported by a beast of burden such as a donkey or a camel. The impact of the Late Antique is apparent even in a religious context. 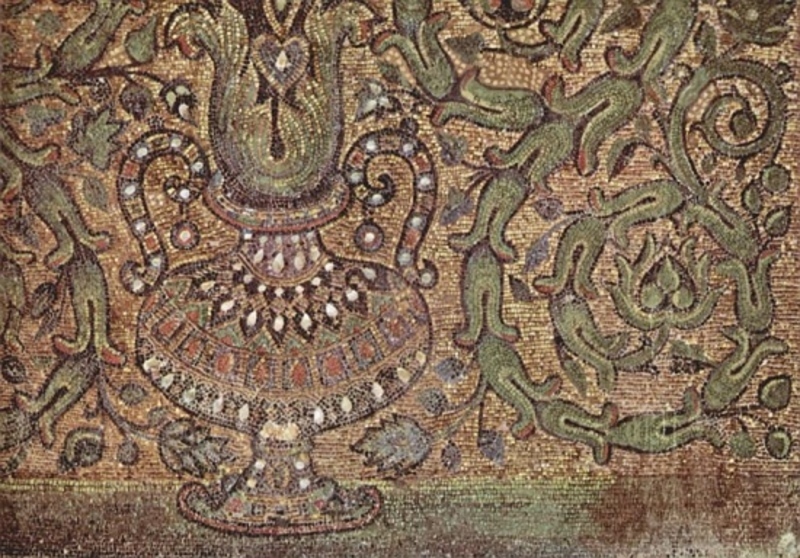 For example, the mosaic decoration from the well-known Dome of the Rock in Jerusalem (completed in 691-2 ), the earliest surviving Islamic monument, draws upon a classical technique and design elements filtered through the prism of Byzantine art. Originally covered with thousands of tiny colored glass cubes or tesserae on both interior and exterior, only the interior decoration survives but even so this includes some 1280 square meters of mosaics including graceful scrolling vines, and bejeweled vases and cornucopias (fig. 7) likely inspired by the work of mosaicists from Constantinople, capital of Byzantium. Furthermore, the centralized plan of the Dome of the Rock was probably inspired by the Christian martyrium; its location on Mount Moriah associates the building with a rich Judeo-Christian tradition: it is build on the site of the Jewish temple mount while the Rock at the center of the building was considered to be the place where Abraham was prepared to sacrifice Isaac (Grabar, 1996). Finally, even the adoption of the codex or book format for the Qur’an again relies on a Late Antique tradition. Fig. 7: Dome of the Rock, Jerusalem, 691-2, interior mosaics, det. Of the many diverse arts that flourished in the first centuries of the Islamic era, textiles played an especially significant role in society, one that persisted in subsequent periods. Textiles were ubiquitous in Islamic lands, serving as clothing, household furnishings, and portable architecture. The manufacture of and trade in textiles were highly sophisticated and profitable industries that built upon pre-Islamic traditions. Often made with costly materials such as silk and gold- and silver-wrapped thread and decorated with complex designs, textiles were luxury goods signifying wealth and social status. Islamic textiles were also widely exported to the West, where there prominence is underscored by their impact on European languages. For example, the English words cotton and mohair derive from Arabic, and taffeta and seersucker from Persian. Such textiles must have been imported to the West from the rise of Islam—for instance an important and early category of seventh–eighth century silks from eastern Iran was used as wrappings for Christian relics in churches in France, Belgium, and Holland. Other textiles from this period found their way into church treasuries, many of them in Spain. Of nearly equal significance to the development of Islamic art was the impact of Persian courtly art and culture of the Sasanian dynasty (224-651), which had previously absorbed and integrated Late Antique influence. Although the dynasty ended with the Muslim conquest of Iran, its artistic traditions continued to mingle with and inspire Islamic art well beyond this early formative period. Combining innovative styles, techniques and forms with previously conceived ones, early medieval art represents a clearly Islamic mode of expression but one marked by strong regional characteristics. Western influences are less direct with the exception of border regions in Spain and southern Italy. Textiles continue to play a vital role as transmitters of Islamic visual culture, especially so-called tiraz. Such cloth, which characteristically bear embroidered or woven Arabic inscriptions supplying the name and titles of the ruler, were produced in state factories and would be distributed by the reigning monarch to members of the court (fig. 8). Like most textiles of this and the preceding period, these survive mainly as fragments, although they once would have been used for robes and turbans and perhaps household furnishings. In Europe, these secular clothes continued to be associated with the spiritual, finding their way into church treasuries. For example, the “Veil of St. Anne” preserved in the Cathedral of Apt, in Vaucluse, France is in fact the tiraz of the Fatimid caliph al-Musta‘ali bi’llah (1094-1101), and is dated 1096-7 (Bloom and Blair, 1997); like other such textiles, the royal name and titles are accompanied by a Muslim formula (the basmalla—“In the name of God, the Merciful, the Compassionate…”). It may be that the Islamic cloth was initially presented to the church as a thanks offering by a returning crusader, perhaps even the Bishop of Apt, who took part in the First Crusade. Islamic inscribed textiles also influenced courtly ceremonial; the cloak made for the Norman King Roger II (fig. 9) is a key example. 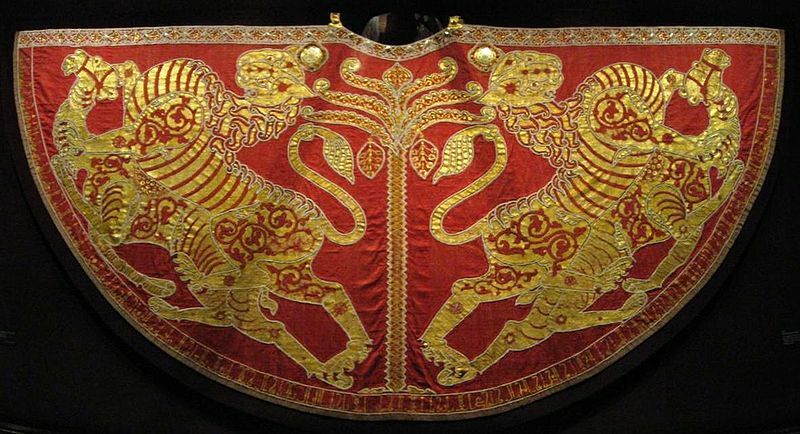 Of red silk embroidered with gold thread and pearls, this spectacular mantle is decorated with a central palm tree separating mirror image scenes of a lion attacking a camel. Around the hem, as might be found on an Islamic tiraz, is an Arabic inscription indicating that the garment was made in Palermo in 1133-4. The mantel was preserved and later used as the coronation robe of the Holy Roman Emperors (Bloom and Blair, 1997). Roger II also commissioned a chapel in Palermo, the Cappella Palatina, built between 1132 and 1140. The wooden ceiling of the chapel in form, decoration, and style is unambiguously Islamic in spite of its Christian purpose. Even the painted depiction of the well-known episode of St. George slaying the dragon is decidedly Islamic in style. Fostered by the Mongol invasions of the mid-thirteenth century, and inculcated with a new taste, especially for Chinese designs and motifs, a new style of art was disseminated throughout Islamic lands. This was a time of brilliant creativity, in which certain preexisting techniques reached their greatest heights and fresh modes of artistic expression were invented. This period is likewise marked by strong dynastic patrons, often foreigners in their own lands, who sought to legitimize their rule and emphasize their own acculturation through vigorous sponsorship of the arts. 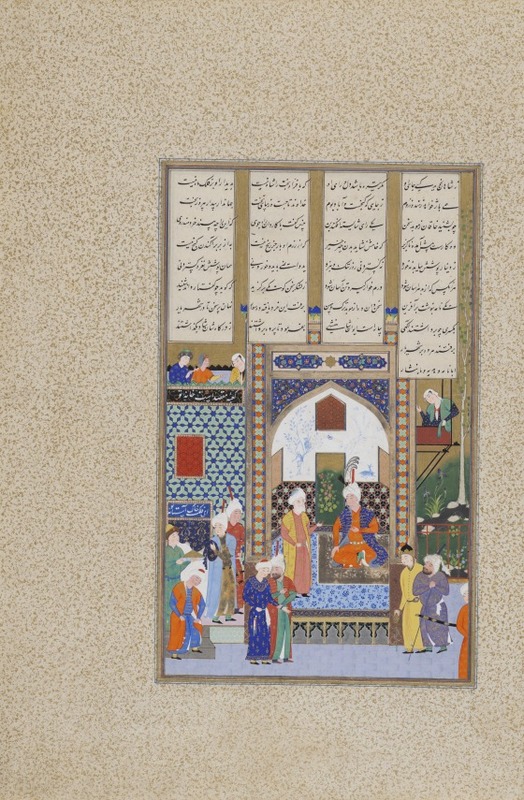 Perhaps the most profound impact of the Mongol invasions on the arts of Iran was the new role of manuscript illustration, which became a significant and influential forum for courtly patronage. Beginning in the early fourteenth century, the main focus of royal patronage was historical works and epic poems. The former were written expressly for the dynasty, whose history and achievements they glorified, most notably the first universal history—the Jami al-Tavarikh or Compendium of Chronicles by the vizier Rashid al-Din. This was an illustrated history and while many of the sources or models for the paintings drew inspiration from China, others were based on western prototypes. 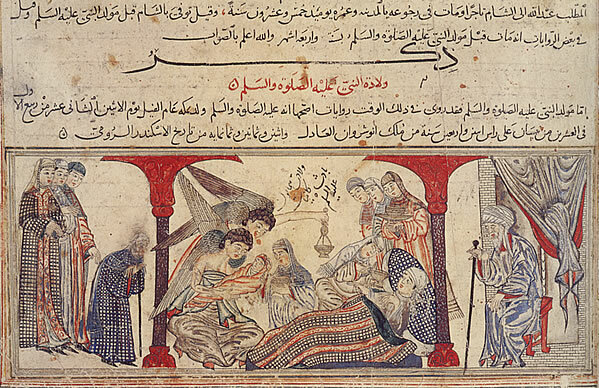 For example, the painting of the Birth of the Prophet Muhammad was adapted from a Christian nativity scene (fig. 10). The Mongol capital in Iran, Tabriz, was thronged with European missionaries as well as merchants and diplomats. This may account for the receptivity to Christian images, which continued in the illustrations to the Great Mongol Shahnama, the epic poem celebrating Iran’s preIslamic kings and heroes. Archetypes drawn from illustrated gospels include: the Adoration of the Magi, Entry into Jerusalem, Carrying of the Cross, and Lamentation; these were freely adopted and adapted to a largely Persian artistic idiom (Komaroff and Carboni, 2002). Inspired by Chinese textiles, Iranian textiles of this period—mostly silk woven with gold-wrapped thread—were highly coveted in Europe. 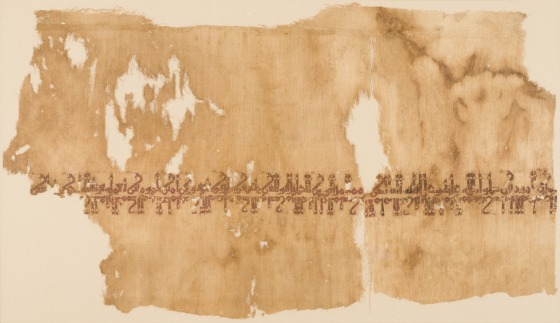 For example, one such luxury silk cloth inscribed with the name and titles of the sovereign Abu Sa‘id (r. 1317-35), obviously found its way to Europe within a few decades as it was made into the burial robe of Austria’s Duke Rudolph IV (d. 1365). The same types of textile designs were also beginning to be produced in Europe; for example, a late fourteenth-century drawing for a textile design by Jacobo Bellini, is based upon an Iranian (Ilkhanid) model (Komaroff and Carboni, 2002). That Islamic textiles and other luxury good continued to be highly coveted in 15th-century Europe, is indicated by the frequency with which such precious materials and objects were depicted paintings. 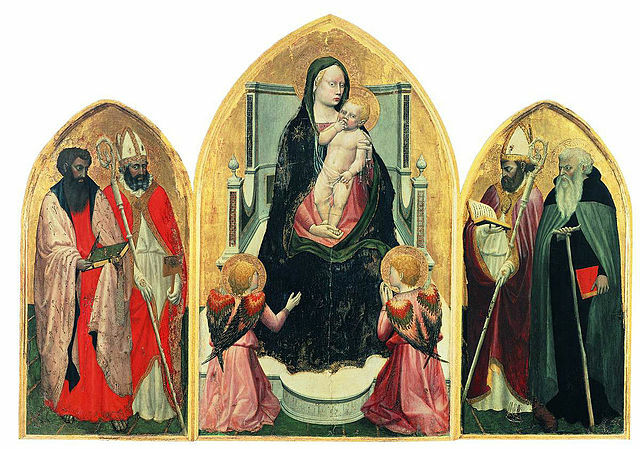 Notable examples include Andrea Mantegna’s Madonna and Child with Angels, the middle panel of an altarpiece in San Zeno, Verona, 1456-59, where the Madonna’s dress and halo bear Arabic inscriptions, evidently inspired by Islamic textiles or perhaps metalwork, while beneath her throne is a Turkish textile (Mack, 2002). European artists were not only inspired by imported Islamic works of art but they also traveled to Islamic lands. For instance, the Italian artist Costanzo da Ferrara visited Istanbul between 1470 and 1480 and the resultant drawings and paintings he produced reflect the influence of Ottoman but especially Persian art. 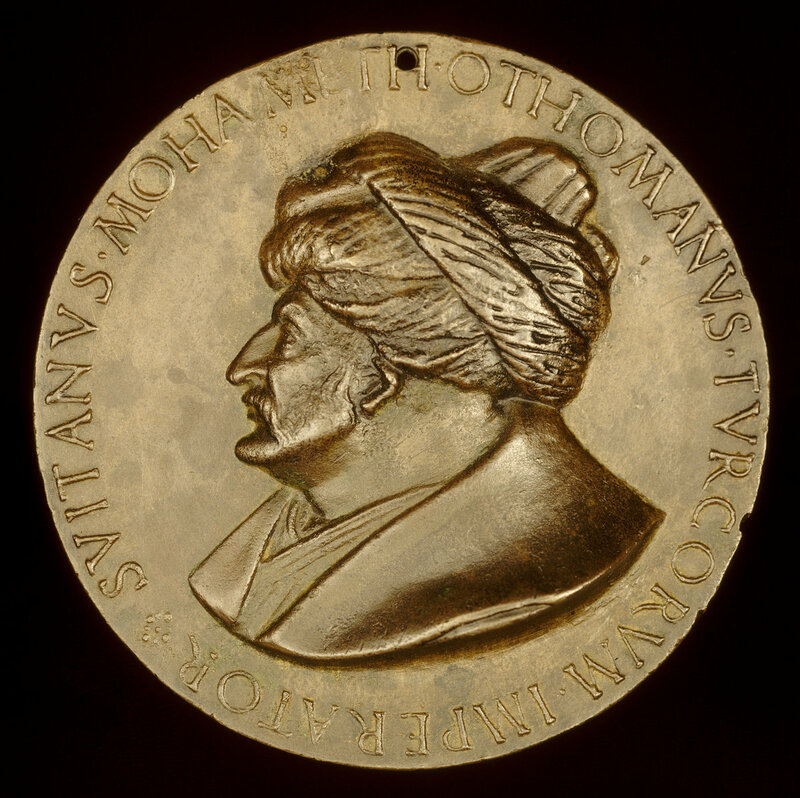 This same artist was commissioned by the Ottoman Sultan Mehmed I (r. 1444-46; 1451-81) to design a bronze royal portrait medallion, something unknown in the Islamic world, which was perhaps intended to proclaim the sultan’s power in Europe and using an entirely western idiom (fig. 11). This same sultan also tried to recruit Italian architects for his palace—the famed Topkapi. As it was in this period, under the Mamluk sultans, who ruled a vast empire from their capital in Cairo, that the crusaders were finally expelled from the Middle East, this section also considers briefly the impact of the Crusades in terms of the exchange of artistic ideas. For example, in Cairo, the mausoleum-madrasa complex of Sultan Qala’un (1283-85), incorporates Gothic-inspired paired windows with oculus, while the associated iron grilles represent Crusader spoils. The spectacular silver and gold-inlaid brass basin in the Louvre known as the “Baptistère de St. Louis” (no actual relationship to Louis IX ever existed as he died before it was made) was produced during this period; it may have found its way to France as a courtly gift or item of trade. Mamluk textiles were also exported to the west—for instance; a silk and gold damask cloth was made into a mantle for a figure of the Virgin Mary. Spain had an especially important role in the transmission of artistic ideas, which may be briefly summarized here as it is in this period that the more than seven hundred-year long Muslim presence on the Iberian Peninsula came to an end (i.e.,1492). Spain presented a unique confluence of Islam, Christianity and Judaism that provided for genuine and at times intense cultural interaction. Luxury objects such as ivory boxes and caskets of the tenth and eleventh-century decorated and decorated with elegant scenes of courtly imagery (fig. 12) conform to the ambience suggested in contemporaneous poetry, which helped to inspire perhaps indirectly late medieval European lyric poetry. Luxury pottery from Islamic Spain decorated in the overglaze painting technique of luster was to have an important impact on the ceramic arts of Italy. This technique combines silver and copper oxides with sulfur and other materials, which are applied in liquefied form to the surface of a previously glazed and fired object. The ware is then refired in a muffled, or reducing, kiln, so that the oxygen is drawn out from the metal oxides, producing a dazzling metallic surface. Such luster wares produced in Manises and then Valencia (fig. 13) were exported from Spain to Italy beginning in the fourteenth century, which led to the creation of the famed Renaissance pottery known as majolica (see below). The late Islamic period was an age of empires, when the Islamic world was governed by three powerful dynasties: the …..in India; and the greatest of the late Islamic dynasties, the Ottomans, who ruled Anatolia, the Arab lands, and much of Eastern Europe. Although the Ottomans already controlled all of Anatolia and parts of Eastern Europe prior to 1453 and their conquest of Constantinople (thereafter Istanbul), which they made their capital, the sixteenth century was the Ottoman golden age. Perhaps even more so than in preceding periods, art was an instrument of dynastic expression in this great age of empires. Spurred by royal patronage, the arts flourished under the Ottomans and Safavids. Ottoman military incursions into Iran in the later fifteenth century, and throughout the sixteenth century, led to the appropriation of artists, works of art, and artistic ideas. Ottoman decorative arts and the arts of the book were thereby enriched by the repertoire of floral and vegetal motifs first developed in fifteenth-century Iran. On many levels this was an international period, in which Ottom… art were each impacted by the aesthetic established in fifteenth-century Iran, while this same style was transmitted to Europe via textiles and other decorative arts. One of the most obvious sources demonstrating the visual discourse between the Islamic world and Europe in this period is the depiction of so-called oriental carpets in both northern and southern European paintings. We know that large numbers of the carpets, Anatolian, Egyptian and Iranian, reached Europe as diplomatic gifts and as items of trade. In the former category, for instance, Venetian ambassadors to court of Henry VIII presented a total of 67 Mamluk carpets to Cardinal Wolsey. The frequency with which carpets appear in European painting not only has helped to lay the groundwork for the dating of different groups of carpets but it has also given rise to the designations of classes of carpets, e.g., Holbeins and Lottos (Ettinghausen, 1974). 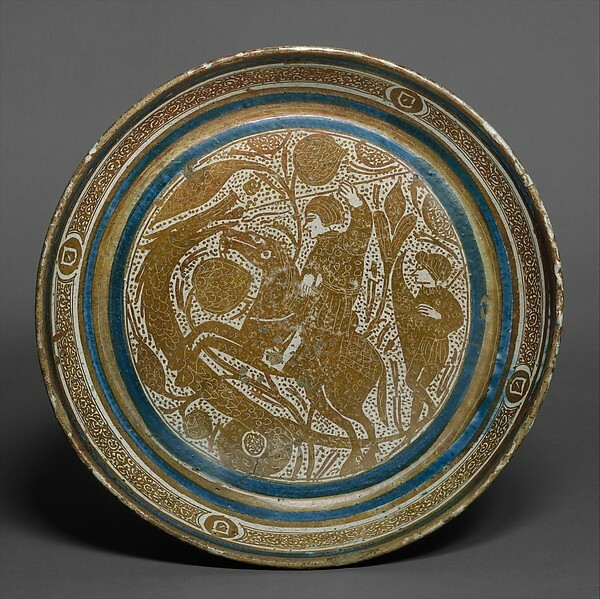 Islamic ceramics, long known and admired in Europe, were especially influential in the development of Italian pottery-making. Luster wares from Islamic Spain and those of later Mudejar manufacture were shipped to Italy via the island of Majorca. These wares were emulated by Italian potters and in time all of the related tin-glazed wares came to be known as majolica. It is generally assumed that the Italians learned the technique of tin-glazing from Islamic potters. Certain shapes were likewise introduced to Italy via Spain, including perhaps the drug jars known as albarelli, which became the model for western apothecary jars. High quality Ottoman pottery known as Iznik ware, after it principal place of manufacture, were also widely exported to Europe. Table services made for the European market could include a coat of arms or other similar devices. A group of Iznik pierced flower vases (figs. 14 a-b) bears a distinctive black insignia on the base in the form of a long-stemmed cross intersected by the Latin letter “S”. Similar devices occur on majolica apothecary jars, suggesting that the flowerpots made for the European market and perhaps more specifically were intended for the majolica factory established by the Medicis at Cafaggolio, which produced some of its own Iznik-inspired wares (Hess, 2004). European inlaid metalwork and enameled glass was also inspired by Islamic examples. Venice played an important role in both of these categories. For instance, Venetian enameled glass lamps inspired by Mamluk prototypes (fig. 14) but decorated with Ottoman designs were even exported to the Istanbul (fig. 15). In a similar vein, Italian textiles designed and woven in emulation of Ottoman and other clothes were exported to Istanbul as gifts and items of trade. The flow of artistic ideas was not merely from east to west, however. Through contact with European art and artists, western concepts of perspective and shading, gradually came to influence court painting in Iran and India, especially from the seventeenth century onward. Contact with Europe also helped to popularize the use of painting on canvas mounted on stretchers, which in Iran, for instance were designed to serve as architectural decoration in princely palaces (Diba). 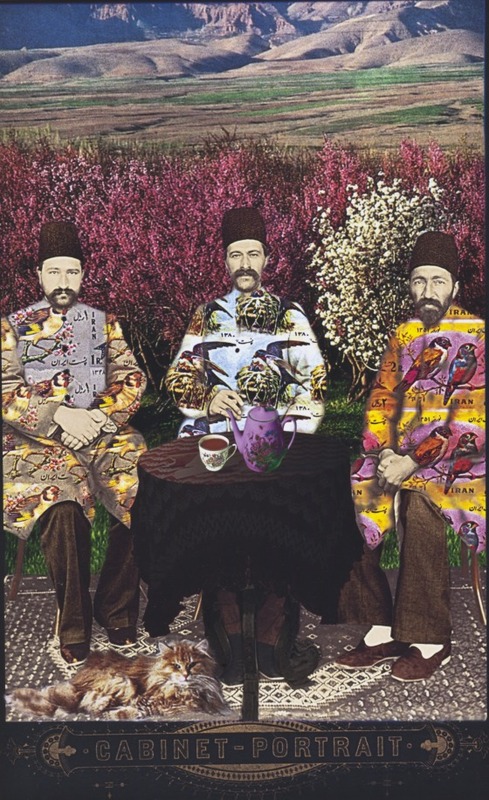 Mostly figural scenes, the style of painting in the eighteenth – nineteenth century under the Qajar dynasty represents an often uneasy blend of east and west (fig. 16). Europeans were also a frequently depicted theme in Iran paintings and decorative arts, especially those associated with the seventeenth-century capital Isfahan. In the arts of the book produced for the Mughal court one finds the use of atmospheric perspective, shading, and the copying of European figures and themes perhaps derived from lithographs. During the reign of the Emperor Jahangir (1605–27), portraiture, whether of humans, animals and even reptiles, became increasingly naturalistic and in closer conformity to western notions of “realism”. For example (fig. 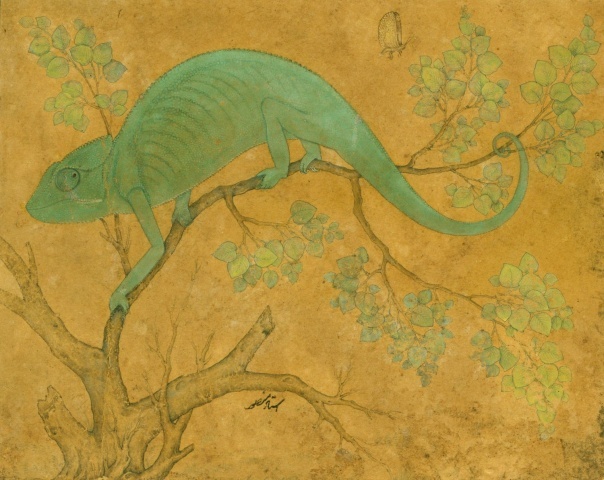 17), a small painting of a chameleon, c. 1610-15, signed by the artist Mansur, in which the roughly textured skin of the lizard is rendered in minute detail, while the slight foreshortening of the creature’s head suggests it is about to whip around to catch a butterfly hovering nearby. Mughal painting had enormous appeal for Europeans of whom one of the best known early collectors is Rembrandt who also made copies after such paintings. Lastly to be considered briefly in this section is the impact of European architecture and architectural decoration in the context of the so-called Ottoman “Baroque” style of the nineteenth century. This is perhaps best exemplified by buildings such as the Dolmabahche Palace. Begun in 1853 by the European-trained Armenian architect Karabet Balian, it combines a remarkable array of western-derived styles, such as the Neo-classical entablature of the facade, while the plan maintains a traditional division between public and private areas (Godwin, 1971). In the nineteenth and early twentieth century, the rise of nationalism and the concomitant recognition of the concept of cultural patrimony led to the creation of state museums in Egypt, Turkey and Iran, based on a western model. In Egypt, for example, the creation of what was to become the Islamic Museum in Cairo in the third quarter of the nineteenth century was spurred on by the frenzied buying of European collectors, whose rapaciousness led to the removal of numerous examples of decorative arts from the religious edifices for which they had been commissioned. The widespread importation of fourteenth-century Mamluk enameled glass objects (fig. 1) for example, also inspired European glassmakers to imitate and emulate this technique. In Turkey, Sultan Abdülhamid II established in 1877 the Imperial Ottoman Museum at the Çinili Kiosk at the Topkapi Palace. From 1881 to 1910 it was under the directorship of Osman Hamdi Bey, who was also a well-known painter working in a European Orientalist manner. Mention has already been made of the use of western artistic techniques but western art-based technology such as photography and lithography also found their way to the Islamic world in the nineteenth century. In Iran, for example, the beginning of photography is associated with the court and the patronage of Nasir al‐din Shah (r. 1848–96), although the Frenchman Jules Richard is credited with making the first daguerreotypes at Tehran in 1844. The then new technology of lithography traveled from Russia to Iran around 1830. A discussion of the twentieth century when artists such Matisse were inspired by their encounters with the Islamic world is beyond the scope of this brief article. Similarly, we cannot take into account the many artists from the Middle East who were trained in western traditions often in Europe and America. Indeed, they were often little known outside their countries of origin and are only just being discovered by a broader audience. In recent years the parameters of Islamic art (particularly as defined by museums, commercial art galleries, and private collections) have expanded to include contemporary works by artists from the Islamic world. These artists draw inspiration from their own cultural traditions, using techniques and incorporating imagery and ideas from earlier periods. They are not so much reinventing Islamic art as they are repurposing it so that it becomes more clearly a vehicle for personal expression, freed from traditional constraints of patronage and functionality. They are also inspired and engaged by western art and culture. This new type of hybrid art will inevitably play an important role in the dialogue between East and West (fig. 18). Blair, Sheila. Islamic Calligraphy. Edinburgh: Edinburgh University Press, 2006. Bloom, Jonathan, and Sheila Blair, Islamic Arts, London: Phaidon, 1997. Etttinghausen, Richard. “The Impact of Muslim Decorative Arts and Painting on the Arts of Europe,” in The Legacy of Islam, edited by Joseph Schacht with C.E. Bosworth, Oxford: Oxford University Press, 1974, 292-320. Komaroff, Linda, and Stefano Carboni, eds. The Legacy of Genghis Khan: Courtly Art and Culture in Western Asia, 1256–1353. New York, New Haven, and London: Metropolitan Museum of Art and Yale University Press, 2002. Grabar, Oleg The Dome of the Rock. New York: Rizzolo, 1996. __The Formation of Islamic Art. New Haven, and London: Yale University Press, second edition, 1987. Mack, Rosamond. Bazaar to Piazza. Islamic Trade and Italian Art, 1300-1600. Berkeley, Los Angeles: University of Californian Press, London, 2002.